Here’s the facts. Both heli skiing and cat skiing offer similar types of experiences – you simply can’t go wrong. 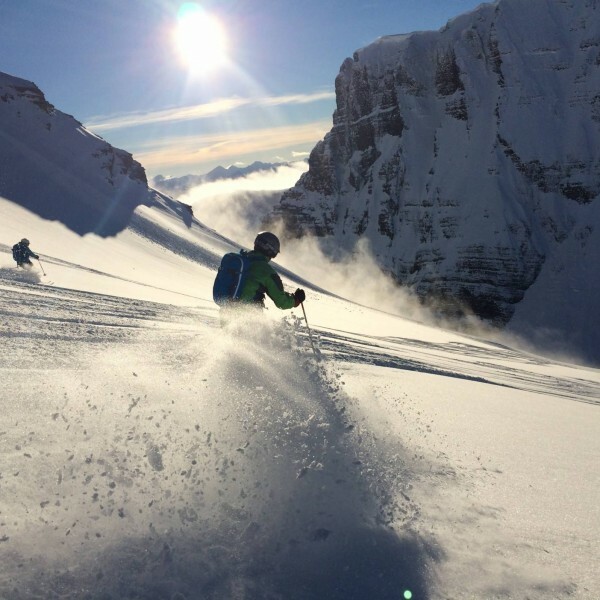 You’ll have simply the best heli ski experience or cat ski experience as the lodges we work with offer awesome powder snow, huge varied terrain, cozy accommmodation, amazing service, delicious gourmet food and more. But there are certain things that differentiate the experience. 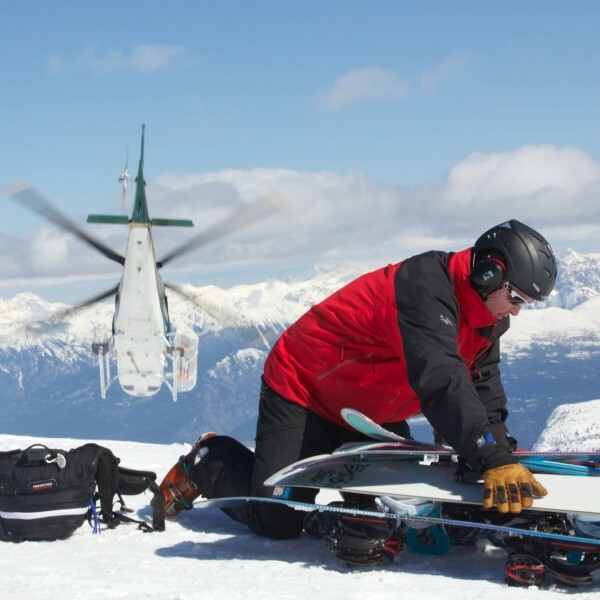 How do you know what’s best for you – Cat skiing or Heli skiing? See below to find out. Heli skiing is the ultimate thrill and adrenaline rush. From childhood, most skiers and boarders dream about Heli-skiing, the pinnacle of the backcountry mountain experience. 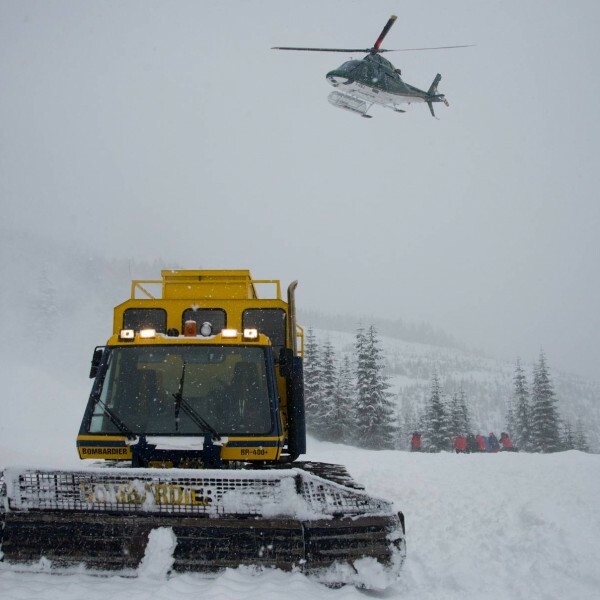 Helicopters lift guests with ease and quickness to untracked powder stashes across peaks and even ranges. There is nothing like flying over majestic mountains and getting a bird’s eye view of rugged and spectacular peaks dripping in deep snow. Because of the speed and nimbleness of the helicopters you can ski tons of runs and rack up a huge amount of vertical (vertical meters skied) each day. You really get the most for your money with Heli-skiing and boarding. While there may be a few days per year that a helicopter can’t fly the group out to go skiing/boarding- generally this is not an issue. And those operators with smaller sized helicopters like BELL A-Stars can fly in almost all conditions and land just about anywhere. That being said, there is still a very slight chance that mother nature may ground a heli for part of, or a full day (see Down Days further down on this page). Heli-skiing is also more expensive than Cat-skiing as fuel and maintenance costs are much higher. The Ultimate Skiing/boarding adventure. Nothing beats the thrill and adventure of heli-skiing. Fast and nimble transportation. Easy access to 1000’s of acres of great powder and varied terrain. Ideal for short trips. You can do in 2 days heli-skiing about what you can in 4 days at a Cat-ski lodge. The best in lodging, food and service. Our heli-ski lodges entertain some very well-travelled guests who expect the best. As such, the standards are high – and the experience is as good as it gets! 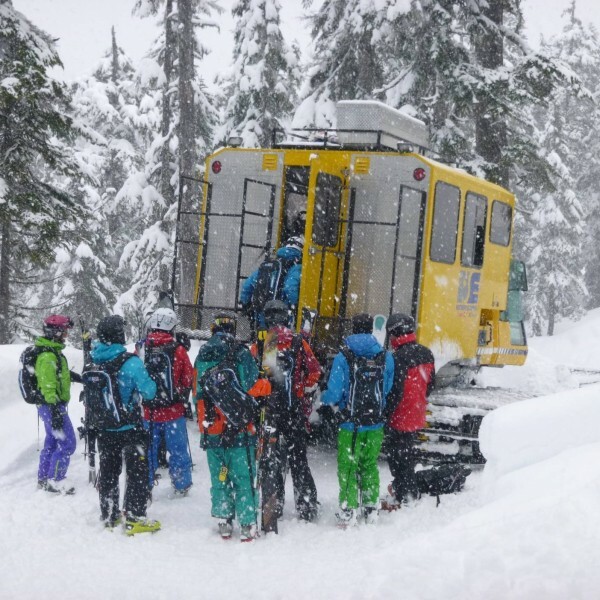 Cat skiing uses a Cat or SnowCat (a treaded, truck-like vehicle – basically a piste-groomer machine with a passenger cabin attached behind) is the perfect vehicle for transporting skiers & boarders up remote mountains. Most Cats hold up to 12 passengers plus guides in comfort. Customers like the fact that the cabs are spacious, heated and offer a comfortable ride up. To access the skiable terrain at a Cat ski/board operation, they build ‘road’ systems that are basically smoothed out paths carved in to the mountain. Once built, the Cats can drive up to the top to drop skiers off at the various points that access the ‘runs’. With only one such SnowCat road you can access a huge number of different runs. While you usually don’t ski as much vertical or number of runs in a day with Cat-skiing, it offers you a more laid back and non-rush day in the backcountry. Plus at a Cat Operation, you can simply sit out one or two runs and relax in the Cat to refresh, for more skiing without feeling the group pressure. No issues with bad weather conditions. Even in the biggest snowstorm with heavy clouds and low light/visibility, a Cat can operate to take guests out to ski in the treed runs. Lower prices. Cats operate with regular- and not pricy jet-fuel. Generally, they also have lower purchase and maintenance costs than Helicopters this all equals great ski deals. More relaxed ski/board experience. Generally you ski/board just as intensely and aggressively as with Heli, but the difference is that you can stay in the cabin as much or as little as you want. So if you know that you’re not in top shape Catskiing can be the best option for you. Kootenay Rockies, BC, Canada: The birthplace of heli-skiing in Canada and the region with the highest number of helicopter skiing operators in British Colombia. Northern British Columbia: One of the largest heli-skiing areas on the planet, with skiable terrain as far north as the 60th parallel. Cariboo Chilcotin Coast, BC, Canada: Deep snow packs, sprawling ice fields, steep descents and some of the highest peaks in BC. Thompson Okanagan, BC, Canada: Prime heli-ski terrain, expansive Provincial Parks, and the highest peak in the Rocky Mountains. Chilkat mountains, AK, USA: The most spectacular alpine terrain, but also most affected by weather this is the sweet spot for heliskiing Alaska. 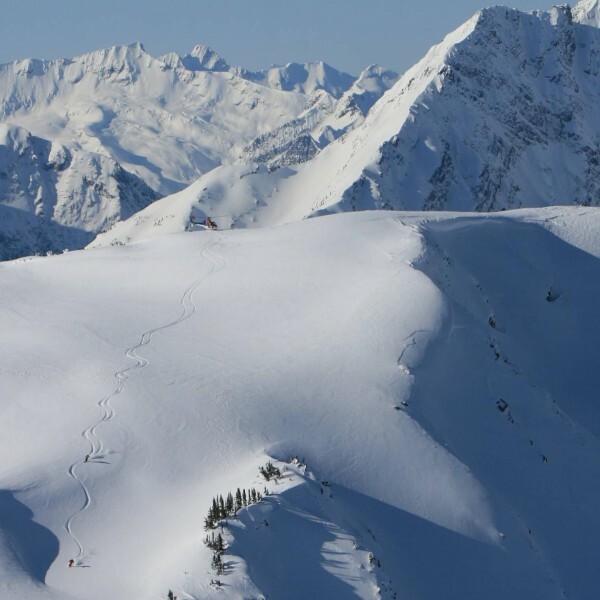 Four mountain ranges stretch across the best Heli ski and Cat Ski region in British Colombia, Canada: the Rocky Mountains and the Purcells in the east, and the Selkirks and Monashees in the west. Plus there is the Cariboo Range in Central British Colombia and the Coast Mountains running along the Pacific Coast. Chilkat range stretch along the coast in the south of Alaska. British Colombia is known for its challenging heli ski and cat ski terrain, but there are some gentler slopes as well that suit most skiers. Ski alpine glaciers, open bowls, tree-lined glades, chutes, steeps and couloirs. Annual snowfall in BC ranges from 10.5 meters on the west coast to a substantial 18 meters in the eastern Kootenay Rockies and the Cariboo Chilcotin Coast. Heli-skiing and Cat-skiing is an obsession in North America, and generally people re-book for the next season on location! Consequently the main challenge to go heli or cat skiing is getting a seat. Through our network we can easily find out which operator has availabilities. This way you don’t need to spend endless hours on the web searching, emailing and making expensive phone calls in the middle of the night (time difference) to each operator. January through March is generally very booked up and we like to suggest early season or late season instead. And these have great advantages – ‘Early Season’ as December traditionally see some huge snowfalls with fresh deep Powder in the treed runs. We also recommend ‘Late Season’ from mid-March through early April. The weather is warmer and sunnier, days longer with more skiing and you get tons of open Bowl skiing and boarding. Often prices are also lower early and late season. We’re all looking for powder… and snow doesn’t fall out of blue skies! Location – direct access to the ski terrain. 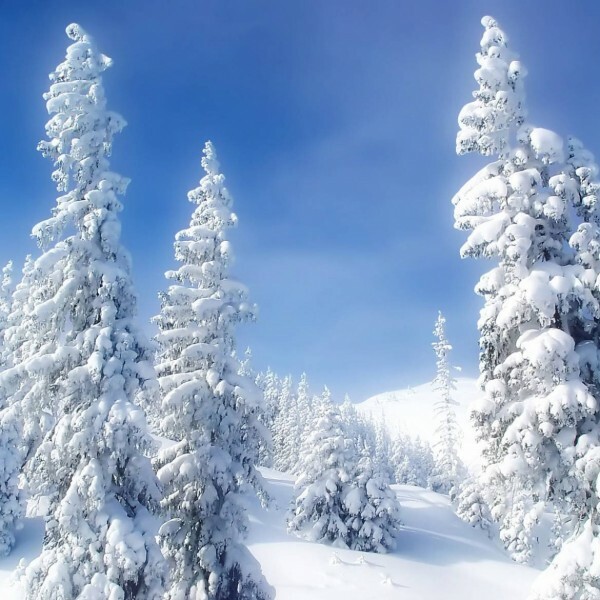 Forests – the lightest and fluffiest snow is found in the trees as it is protected from the sun and wind. When it is snowing heavily the tree trunks give our amazing pilots points of reference for safe flying……….and they help you navigate while skiing! Small Groups – the guides love managing small groups because they are very mobile and adaptable. When it is snowing heavily and we are unable to fly we will wait until there’s a clearing and when it’s safe, we can quickly head out to get you skiing. Consequently there will be a few down days every season, and you’ll just have to keep your fingers crossed that it won’t happen while you’re there. weather does not allow the helicopter to lift. Pre-breakfast— The guides rise early to go over snow conditions, make safety checks and make decisions on where you will be skiing that day. Breakfast, approximately 7:30 am — Most lodges will offer buffet with a wide selection of nutritious choices to start your day, everything you need to hit the powder. Post-breakfast, approximately 8:30 am (first day only) – Everyone will participate in the safety training to make sure everyone knows how to use their personal safety equipment. There will also be a Helicopter or SnowCat briefing. Late morning — You will head out for your first runs. Lunch— To maximize skiing and snowboarding time lunch will be out in the field. Late afternoon, approximately 4:00 4:30 pm (depending on the time of the year) — You make your final turns and return to the lodge. Note: December and early January’s last run come in a bit sooner due to earlier dusk. Early evening, approximately 4:30 – 7 pm — Après ski, free time, massage, sauna, and hot tub relaxation or just hanging out with your new best friends going over your awesome day and sharing a refreshing drink of your choice. Evening, approximately 7 pm – your three-course gourmet dinner is served. Post-dinner – if you still have the energy there is opportunity to hang out by the bar, relax by the fire, or play any of the board games or a game of pool.